What is worrying Russia? Why is the country convinced that it is the victim of a campaign to make it look bad? President Dmitry Medvedev recently announced the setting up of a commission to counter the falsification of history. He said this was becoming increasingly "severe, evil, and aggressive". "This is absolute poppycock," says Robert Service, professor of Russian History at Oxford University. "History is all about argument. There is no absolute historical truth about anything big in history." Mr Service dismisses the Russian leader's suggestion that his country is facing some kind of academic aggression. Instead, he sees a desire to dominate, worthy of the most repressive totalitarian regimes of fiction. "President Medvedev, following in the path of his predecessor President [Vladimir] Putin, wants to control history," he says. "And he wants to control history as a means of controlling the present. This is the classic George Orwell scenario." Many Russians, though, agree with their president. Natalia Narochnitskaya, a former deputy in the Russian parliament and now a member of the new Historical Truth Commission, says that she is surprised by what she terms the "almost hysterical reaction" in the West. "In the Western media especially, there is a certain prejudice against Russia and Russian history," she says. "They always feel that Russia since, you know, Ivan the Terrible, is a certain country which is off the European civilisation." Ask a few more questions, though, and these two apparently separate views begin to converge. At least, they agree on what the key issue is - World War II. And here lies the clue as to the real reason for the establishment of the new commission. This is what appears to anger today's Russian historical establishment: accounts of Red Army crimes on the march to Berlin; assertions by the Baltic countries and others in Eastern Europe that Soviet forces came as occupiers as much as liberators; any suggestion that Stalin's Soviet Union and Nazi Germany were anything but complete opposites and bitter enemies. Here, perhaps, there is a clue as to the timing of the commission's founding. Next month sees the 70th anniversary of the non-aggression pact between the USSR and Hitler's Germany, something Ms Narochnitskaya expects the West to make a lot of noise about. 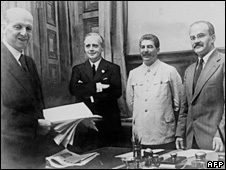 "In August there will be such a yelling about the Molotov-Ribbentrop Pact, saying that that was the step that led to the Second World War, and that Germany and the Soviet Union were two equal, disgusting, totalitarian monsters." Why does this matter today? Do these arguments have any great importance beyond the walls of universities? In Russia, the answer is yes. 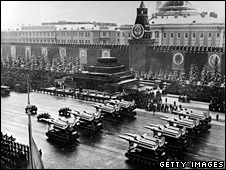 The country sees its victory over Hitler's forces as the greatest moment of the 20th Century. Russia's past haunts its present. Recognising that, the authorities want to rule the version of the past which dominates today. Tamara Eidelman, who teaches history at a Moscow High School, feels surrounded by nationalist sentiment. "So many people are speaking about strong, Orthodox Russia, military power," she says. "It is something that is very strong in historical tradition and in popular opinion. This commission is partly a response to this atmosphere." The creation of this commission seems to go to the heart of what troubles modern Russia. The chaos which followed the collapse of communism left many Russians deeply distrustful of politics and officialdom. 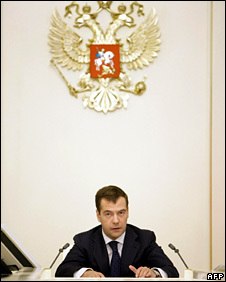 President Medvedev has complained of the corruption and "legal nihilism" which plague his country. 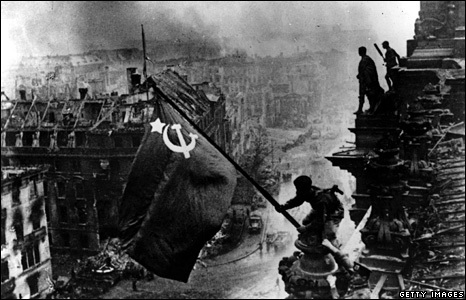 Russia's leaders today know that they need this shining, sacred, memory of victory to give their people something to believe in. In the near future, it may even be backed up in law. The Russian parliament is on its summer break at the moment, but legislation is being considered - legislation that would make it a criminal offence to "infringe on historical memory in relation to events which took place in the Second World War". James Rodgers was formerly the BBC's Moscow correspondent.